Newsletter 165: Top Studio gives you wings!!! Top Studio gives you wings, and SpotModel puts them right at your door :) What are you waiting for flying? 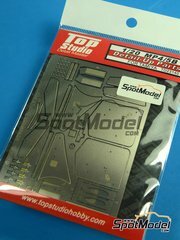 A super-incredible product from Top Studio, the super-detail set for Tamiya RB6. Inside that box, you have a bunch of spectacular resin parts, several photoetch sheets, steel turned parts, galvanized parts, seatbelt fabric, wirings, a wonderful instructions manual... What else do you need to build a perfect model? 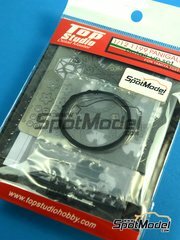 "Quality", "realism" and "awesome" are the only three words we have to write about this excelent product from Top Studio for enhancing the cockpit of Tamiya RB6. A few resins, a pile of photoetches and some pieces of fabric that, all together, will make your kit look AWESOME, right? Forget about the dull plastic chain that comes with the kit and mount this gorgeous chain assembling it one link at a time, exactly the way real chains are built. The look of the chain once finished and mounted is just as mind blowing as you can see in the pictures. 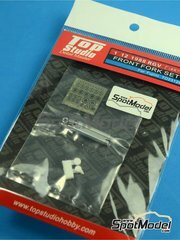 Give a truly realistic touch to your Suzuki with this detail-up set for the front fork of Fujimi kit. 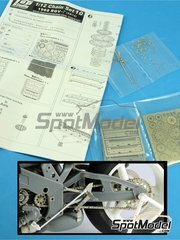 Accomplishing so will be a piece of cake with the included photoetches, metal turned parts, resins parts, and your seasoned modeler hands. 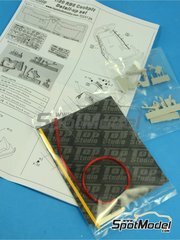 Don't take any risks with the finish of your beloved kit and give it a realistic look with these detail-up set from Top Studio. Made of metal turned parts, it also features several resins and photoetches for enhancing brake discs, wiring, connectors, radiator, front fork and several other engine parts. 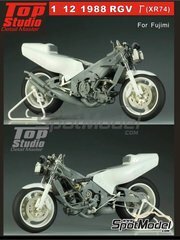 Top Studio brings us a very interesting set of photoetches for the Ducati Panigale. In addition to a good pile of photoetches, you'll get to build the rear shock absorber, electrical wirings and a few turned metal parts. As you can see, the results just speak for themselves. 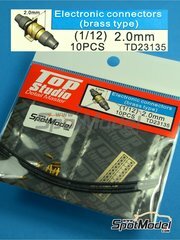 Top Studio will allow you to add several essential details to your MP4/5B that will make your kit shine as it deserves. 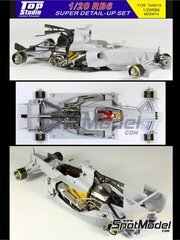 The set includes the vertical planes for the front spoilers, rear spoiler brackets, thermal protectors for the heat exchangers, exhaust pipe joints and a few more parts. 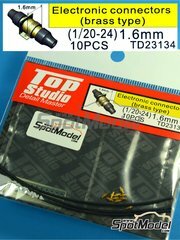 If you are into race cars and bikes in 1/12 scale, don't miss this connectors: they'll completely overhaul the looks of your kits. Bronze made and CNC turned for ultimate detailing, they also include photoetches for the brackets and several heat-shrinking tubes for simulating the electrical piping. 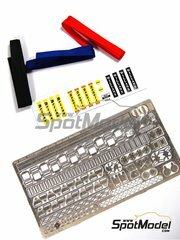 If you build 1/12 scale cars and want to add that extra touch of realism that your kit deserves, don't doubt and add these electronic connectors that will bring it to life. The set includes 10 bronze CNC turned connectors, plus one photoetch sheet for the brackets and several heat-shrinking tubes for simulating the electrical piping of the car. Connector diameter is 2.6mm. 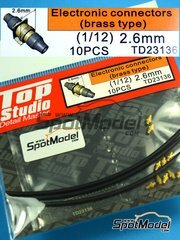 Your Formula One models in 1/20 scale, and your GT's and Rally cars in 1/24 are going to look completely real after using these electronic connectors. Bronze made and CNC turned with a wealth of details, they also include photoetches for the brackets and several heat-shrinking tubes for simulating the electrical piping. Diameter measures 1.6mm, and they can be used in both scales. 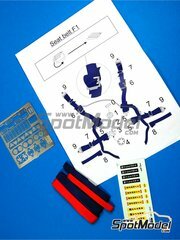 This set of harness buckles have been specifically designed for Formula One kits in 1/12 scale. The set includes photoetched buckles, Britax / Sabelt / Willans decals and red and blue seatbelt fabric.